The Bull temple one of the oldest temples in Bangalore, the capital of the state of Karnataka was built by Kempegowda, a ruler under the Vijayanagar Empire. Located in Basavanagudi, a residential and commercial area in South Bangalore, the temple on a hillock at the southern end of the Bull Temple road, draws thousands of devotees from all over the country. 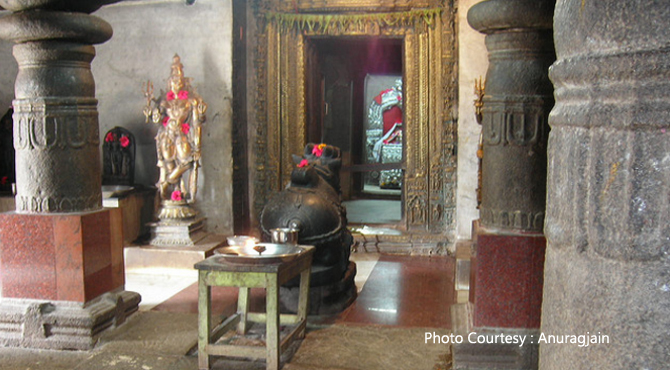 The name Basavanangudi in the local language Kannanda, means the Bull (Basavana) Temple (gudi). This 16th century typical Dravidian style temple dedicated to Lord Shiva's bull mount Nandi, is also known as the Nandi temple. An interesting story behind this temple is that the surrounding area known as Sunkenahalli was famous for growing groundnuts. The farmers found that their fields were ransacked after every full moon day. One day a farmer saw a bull grazing in the field and hit the animal with a club. Suddenly, the bull sat down and started growing bigger and bigger. The original colour of the Nandi bull was grey which has now turned black due to the constant application of coconut oil by the devotees. There is a belief that the source of the river Vishwa Bharti originate at the feet of this statue. At the base of this statue, there is an inscription dates back to the 17th century. Entry to the temple is free and the daily timings are from 6a.m. to 8 p.m. On all weekends, music concerts are organized in the temple.